Orto di Casa Cecconi: Succession sowing: yeah! For the first time in four years I have managed some succession sowing, so I should be sorted with salad leaves most of the summer. Yeah! They did come back, so - as I picked another fifth - the first one is regrowing. In addition to that, the other bed is starting to germinate right now, two weeks on. This is great, and the first time I manage to do it successfully. Pity I have not managed to do the same with rocket (it did not come up for two months and is just starting now to germinate, quite erratically) or radish (it bolted rather than swell at the root). I will leave both to self-seed. Last year leaving poorly germinated rocket to self-seed was the best thing I did, as it came back with a very decent crop the second time round, more or less September time. However that is not enough: I want more. 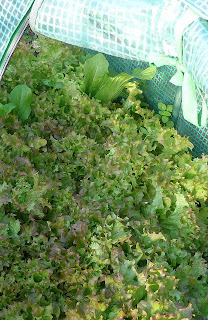 If I manage to go a bit more often to the plot now, I will try some more direct sowing.